aligned correctly, problems can arise. Crowding of adjacent teeth, nerves, or bone can result, or they can decay due to entrapped debris. If wisdom teeth only erupt, or “come in” partially, they can be trapped in the gum and become infected. 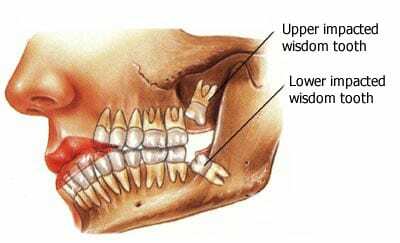 If your wisdom teeth are impacted (not fully erupted) they may have to be surgically removed. In this case, your dentist will send you to an oral surgeon. Typically, an incision is made in the gum and the tooth or teeth are extracted. If the tooth has “come in,” then the extraction, if needed, is usually no more complicated than the removal of any other tooth. Patients whose wisdom teeth are removed usually receive a local anesthetic such as Lidocaine and possibly additional medication such as nitrous oxide (“laughing gas”) and oral and/or intravenous sedatives. Generally speaking, the removal and recovery processes are easier in younger patients because the roots of the teeth are less developed than in older patients. As with any other procedure, the healing time depends largely on the complexity of the procedure. Simple extractions heal more quickly than a surgical extraction. Your oral surgeon and/or dentist will monitor your recovery and give you specific instructions regarding bleeding, pain control, and care of the blood clot that will form in the socket where the tooth was. Following these instructions carefully and following up as recommended will help ensure a safe and uncomplicated recovery. After a procedure to remove a wisdom tooth, some patients can develop paresthesia. This is a numbness of the lip, chin, or tongue. While this is not a common complication, it can happen if the nerves around the extraction site are damaged during the procedure. It may last days or months, or it may be permanent. A more common potential complication is dry socket. This happens when either no blood clot forms where the extracted tooth was (the socket), or the blood clot is dislodged. Your dentist or oral surgeon will advise that you use no sucking motions (e. g. smoking or drinking through a straw) for about 24 hours post-extraction since these activities can dislodge the clot. If dry socket occurs, it usually happens about 3 to 4 days post-extraction and causes bad breath and pain. It is treated by medication applied at the dentist or oral surgeon’s office.